The crossbow and bolt, above, were part of a collaboration with Simon3D, one of the top British modelers. 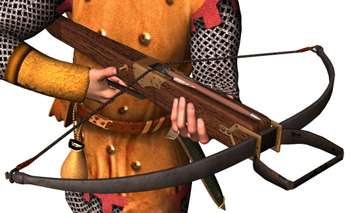 The custom-built props package consisted of a Light and a Heavy crossbow, plus both kinds of bolts, a quiver, and two types of crossbowmen shields, with texturing for all. The pose / motion work consisted of cocking, loading, and firing sequences. See more of Simon3D's work at DAZ3D. Click on the DAZ logo. Shown here are a variety of three-dimensional models, custom-built in collaboration with Don Albert Graphic Arts. Don Albert Graphic Arts has worked and collaborated with some of the top 3D content-provider modelers in the USA, Britain, and Australia. When you need to show 3d models of your products, or other hand-held objects, vehicles, or architecture, and how they work and interact with people, contact us. All images are copyrighted and may not be downloaded or reproduced. This section is still under construction. Come back later to see more.